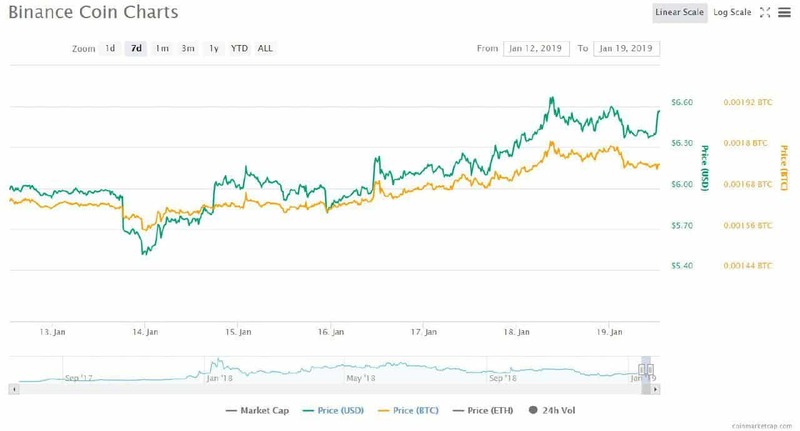 Binance Coin (BNB) has seen significant growth in the previous several days, while most of the crypto market traded in the red. The increase in price is believed to be impacted by several high-profile events concerning Binance in January 2019, such as the pending Binance Blockchain Week, as well as the launch of Binance Jersey. Binance Coin (BNB), currently ranked as the 14th largest cryptocurrency by market cap, has recently experienced significant gains of around 18% during the past week. The coin, created by the largest cryptocurrency exchange in the world, Binance, has grown while most other top cryptos traded in the red during the past week. BNB is one of the most popular coins on the exchange, as it allows crypto traders to benefit from using it by receiving a significant discount on the exchange’s fees, as well as being a base asset (such as Bitcoin and Ethereum). However, the reason for the recent growth is likely influenced by additional factors, apart from the coin’s utility on Binance. In fact, Binance has announced several significant news and events recently. One of the most significant influences on BNB coin’s current performance is arguably one of Binance’s most significant events in early 2019 — the official launch of Binance’s new EUR/GBP fiat exchange called Binance Jersey, which occurred a few days ago, on January 16th. The new exchange allows Binance users to exchange Bitcoin and Ethereum for either EUR or GBP, which will likely lead to a growth in interest in crypto, as well as the expansion of the exchanges user base. Another big event believed to be impacting the coin’s price is the upcoming Binance Blockchain Week. The event will take place in Singapore from today, January 19, to January 22. As we know Biance, We can anticipate interesting announcements coming up on behalf of the popular exchange. 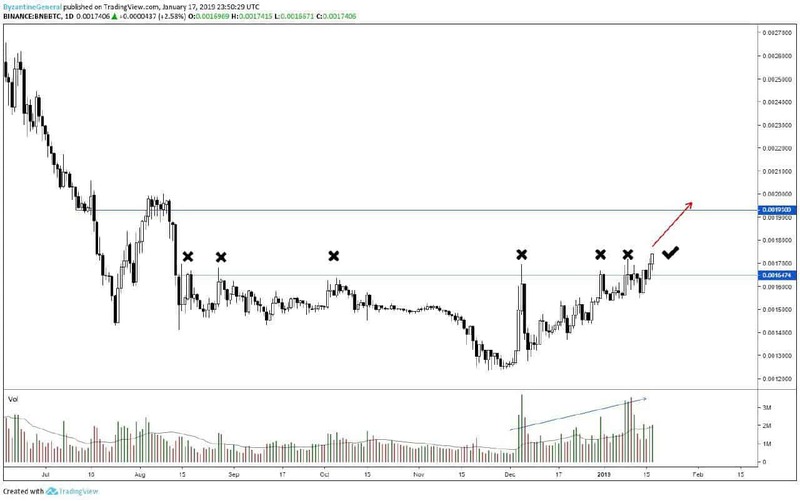 For more than six months, BNB has failed to break up the 0.00165 BTC resistance level. Yesterday it finally happened, and BNB recorded a 0.001825 BTC peak in Binance. Against the dollar, BNB has been trying to find stability at around $6, after recording a weekly low around $5.54 on January 14th. Following the news, BNB started growing once more, increasing by approximately 18% in a matter of days. The coin climbed to $6.69 yesterday, January 18th, which is its second highest peak in 2019, bested only by the increase that reached $6.85 on January 9th.